This article is about the British ceremonial sword. For articles with related names, see Cortana (disambiguation). Curtana, also known as the Sword of Mercy, is a ceremonial sword used at the coronation of British kings and queens. One of the Crown Jewels of the United Kingdom, its end is blunt and squared to symbolise mercy. The current sword is a copy made in the 17th century. The original is thought to be the same as the unnamed regalia sword purported to be Tristan's sword. The claim of Curtana being the sword of Edward the Confessor is probably spurious. The sword measures 96.5 cm (38 in) long and 19 cm (7 1⁄2 in) wide at the handle. About 2.5 cm (1 in) of the steel blade's tip is missing. The blade features a decorative "running wolf" mark which originated in the town of Passau, Lower Bavaria, Germany. It has a gilt-iron hilt, a wooden grip bound in wire, and a leather sheath bound in crimson velvet with gold embroidery. The sheath has been remade several times since the 17th century, and the current one was made in 1937. The name Curtana or Curtein (from the Latin Curtus, meaning short) appears on record for the first time in accounts of the coronation of Queen Eleanor of Provence in 1236 when Henry III of England married the queen. It occurs as "Curtana" in the "Red Book of the Exchequer" as one of the three swords used in the services; and called "Curtein" in Matthew Paris's Chronicle which identifies it with the "Sword of Edward the Confessor". This sword may been the same as the so-called "Tristram's sword", kept as part of the regalia according to earlier Angevin dynasty records. An inventory for two swords, "namely Tristan's sword (scilicet ensem Tristrami)" and one other, is recorded in the patent roll for the year 1207, where King John issued a receipt for them. Any credible relic claiming to be "Tristram's sword" would have to be broken-tipped, since the Tristan of romance had his sword damaged in combat with Morholt, with the tip lodged in the enemy's skull. Therefore the inference can be made with "little doubt" that this was in fact the sword later called Curtana, according to Roger Sherman Loomis. It has also been suggested that the name of the regalia sword "Curtana" might have been borrowed directly from Ogier's sword "Cortain", which is also spelt "Cortana" or "Curtana" in Italian renditions. Until the 14th century, it was the job of the Earl of Chester to carry the sword before the monarch at his or her coronation. Today, another high-ranking peer of the realm is chosen by the monarch for this privilege. When not in use, the sword is on display with the other Crown Jewels in the Jewel House at the Tower of London. The current sword was made between 1610 and 1620, likely by Robert South, a member of the Worshipful Company of Cutlers, and was supplied for Charles I's coronation in 1626, whereafter it joined the coronation regalia kept at Westminster Abbey. For almost 200 years until then, a new sword had been usually made for each coronation. [j] Its blade was actually created in the 1580s by Italian bladesmiths Giandonato and Andrea Ferrara and imported into England from Italy. [k] Together with two Swords of Justice and the Coronation Spoon, it is one of the few pieces of the Crown Jewels to have survived the English Civil War intact, having been sold to Roger Humphreys for £5 in 1649. It is not clear if the swords were used by Charles II, but they have been used continuously since the coronation of his successor James II in 1685. ^ Compare Edward Walker's sketch for the sketch of the original sword used to make the replica for Charles II, versus the Francis Sandford's etching. ^ Legg credits H.A. Wilson for the intelligence on "obtuse" angle. The difference in the sharpness of the angle at the tip is clearly distinguished in the etchings printed by Francis Sandford. For comparison, see current photographs of the unsheathes swords. ^ What Loomis contends is that the prose romancer betrays his knowledge of the English sword being originally considered Tristan's, even while the English themselves had forgotten about it, their memory overwritten with its connection to Edward the Confessor., even though the connection with Edward's sword was spurious, since there was no record of St. Edward's sword ever being recovered. ^ Ditmas did not view the English as so forgetful. She contended that the English literati, such as the chronicler Matthew Paris would have surely known about Ogier's sword Cortain, and the English sword was named Curtana through adoption of the tradition that Tristan's sword became Ogier's Cortain. So in her view, it was the regalia lore that imported the romance tradition, not the other way around. ^ When St. Edward's grave was opened in 1102 and his crown, ring, scepter, and sandals were removed and entrusted to Westminster Abbey. ^ Roger of Hoveden's chronicle, referring to "tres gladios Regios (three royal swords)", etc. Hoveden is "somewhat fuller" and "near contemporaneous" compared to other accounts. The "earliest detailed account" on English coronation (Legg (1901), p. 46). ^ Henry IV as Earl of Derby also acted one to carry the sword. ^ It was employed with the "Sword of the Church (lespee de leglise)", quoted from the Chroniques of Jehan de Waurin, given by Legg. ^ Legg on p. xxv, note 2, quotes an account of Henry VI's corronation from Ms. Harg. 497, fol. 30, but there it is not clarified if Curtana is the Sword of Mercy. Legg on p. 193 says the meanings are given on fol. 29 of the same manuscript, but does not copy out the text. ^ Around the time of Richard II the sword was a permanent fixture of the regalia. ^ It had been noticed (at least by 1950) that the Curtana's blade bore a wolf-mark, as did the Sword of Temporal Justice, and on the Sword of Spiritual could be made out a half-effaced inscription that possibly read "Andrea Ferrara". ^ a b c d Kenneth J. Mears; Simon Thurley; Claire Murphy (1994). 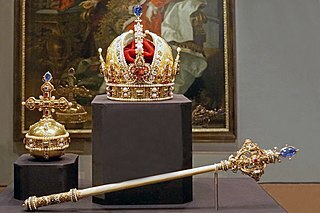 The Crown Jewels. Historic Royal Palaces. p. 9. ASIN B000HHY1ZQ. ^ a b "The Sword of Mercy". Royal Collection Trust. Inventory no. 31730. ^ a b c Anna Keay (2011). The Crown Jewels. Thames & Hudson. p. 30. ISBN 978-0-500-51575-4. ^ a b Sandford (1687), p. 36. ^ a b Younghusband, George; Davenport, Cyril (1919). The Crown Jewels of England. Cassell & Co. p. 38. ASIN B00086FM86. ^ "The Sword of Spiritual Justice". Royal Collection Trust. Inventory no. 31729. ^ "The Sword of Temporal Justice". Royal Collection Trust. Inventory no. 31731. ^ Concise English Dictionary. Wordsworth Editions. 1993. p. 221. ISBN 978-1-84022-497-9. ^ Murray, Sir James Augustus Henry; Bradley, Henry; Craigie, Sir William Alexander; Onions, Charles Talbut (1893). Oxford English Dictionary. 2. p. 1277. ^ Legg (1901), pp. xxiii, 58, 62 (trans.). ^ a b Loomis (1922b), p. 59. ^ a b Loomis (1922a), p. 29. ^ Ditmas (1966a), p. 92. ^ Curtis, Renée L. (trans. ), ed. (1994), The Romance of Tristan, Oxford, p. xvi ISBN 0-19-282792-8. ^ Ditmas (1966a), p. 92: Commenting on Loomis's theory, writes "'sword of supposition is strengthened by the fact that Matthew Curtein, and Curtein was the name given to the sword of Ogier the Dane which..", etc. ^ Mason, Emma (1990). Harper-Bill, Christopher; Harvey, Ruth (eds.). The Hero's Invincible Weapon: an Aspect of Angevin Propaganda. The Ideals and Practice of Medieval Knighthood III. Boydell & Brewer. pp. 132–134. ISBN 978-0-85115-265-3. ^ a b c Ditmas (1966a), pp. 92–93. ^ a b Ditmas (1966b), p. 125. ^ Pearce, Mark (2013). "The Spirit of the Sword and Spear" (PDF). Cambridge Archaeological Journal. 23 (1): 56. ^ a b Aurell, Martin (2007). Harper-Bill, Christopher; Vincent, Nicholas (eds.). Henry II and Arthurian Legend. Henry II: New Interpretations. Boydell Press. p. 373. ISBN 9781843833406. ^ Cf. also Martin Aurell. ^ Taylor, Arthur (1820). The Glory of Regality: An Historical Treatise of the Anointing and Crowning of the Kings and Queens of England. R. and A. Taylor. pp. 72–74. ^ Planché, James Robinson (1876). A Cyclopaedia of Costume Or Dictionary of Dress. Chatto and Windus. pp. 157–158. ^ Strickland, Matthew (2016). Henry the Young King, 1155-1183. Yale University Press. p. 57. ISBN 9780300219555. ^ Strickland (2016), p. 86. ^ Legg (1901), pp. xxv, 51, 52; 48, 49. ^ Legg (1901), pp. 132, 146, 150, 167. ^ a b Legg (1901), pp. xxv, 193. ^ a b Strong, Roy (2006). Coronation: From the 8th to the 21st Century. Harper Perennial. p. 268. ISBN 978-0-00-716055-6. ^ Legg (1901), pp. xli–xlii. Legg, Leopold George Wickham (1901). English Coronation Records. A. Constable & Co. pp. xxiii, xxv, xli, lxxiii., 57, 58, 62, 80, 85, 115, 131, 145, 150, 165, 167, 180, 198, 219, 227, 234, 248. ASIN B002WTYP2Q. Archived from the original on 4 September 2014. Sandford, Francis (1687). The History of the Coronation of ... James II, ... King of England, Scotland. Thomas Newcomb. A sword of justice is a ceremonial sword used as insignia of a monarch's supreme judicial power. In some cases this may have been an executioner's sword that was no longer used for executions, becoming instead a ceremonial one.